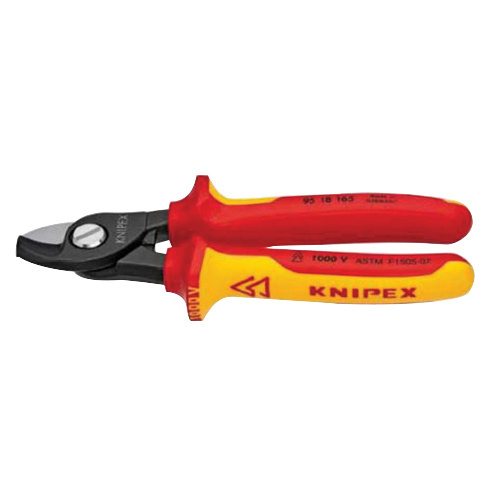 Knipex Insulated cable shear has jaw with a capacity to cut 19/32-Inch Dia copper cable and 1-31/32-Sq-Inch copper cable. It has insulated handle with multi-component grips. Cable shear with an overall length of 6-1/2-inches, accommodates 1/0-AWG wires. It has tool steel, forged, oil-hardened steel construction for added strength. It is suitable for cutting copper and aluminum cables, single and multiple wire. Self-locking cable shear meets IEC 60900 DIN EN 60900 and VDE standards.